A month ago I thought my silver coin finds were starting to peter out. Then I went back to a large area park where I found quite a few wheats, but no silvers. Then I hit a silver dime and my confidence grew at this site. Then I hit another dime and another. I know what my problem was, I didn’t hit it hard enough before and my confidence was too low. It’s amazing how much better you will do when you believe silver is there. What’s so astonishing about this park is I found 3 Indian head pennies, 2 silver Washington quarters, Barber dime, Mercs and silver Rosies. This land wasn’t made a park until the 1940’s, but a small lake has been there since the late 1800’s. So you NEVER really know whats in the ground where you hunt. I did spend hours hunting finding nothing there and then you hit a hot spot that makes it all worth it. Another interesting note is I hit a coin spill that rang up all ugly. The numbers were all over the place, but enough silver numbers came through for me dig. 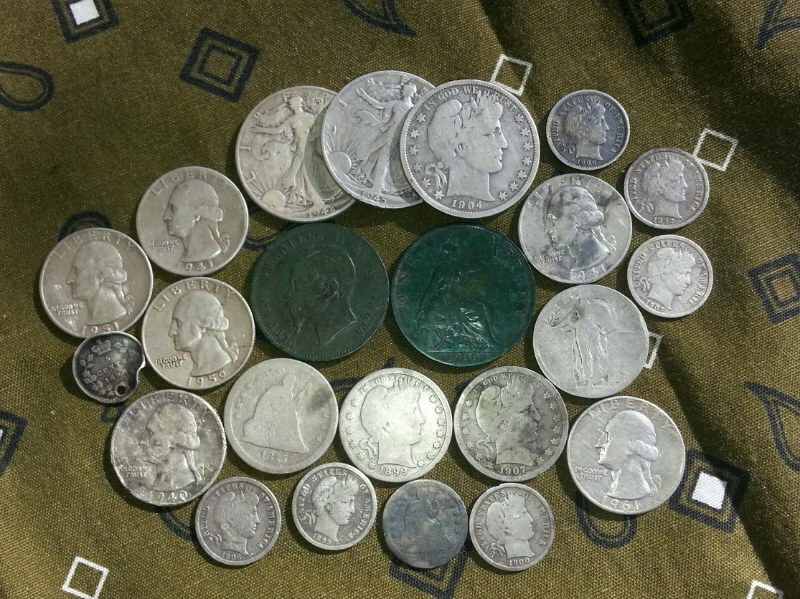 I found two silver quarters, six wheats and two memorials. Amazing! I’m glad I found the silver quarters since my quarter finds have been low this year. I also found my first silver Canadian dime. So a park I had no confidence in for silver turned out to be a winner. You just never know……..